When the third session of qualifying got underway today at Interlagos, we were expecting Webber and Vettel to duke it out for top honours, whilst Alonso tried his best to get amongst them. What no one could have predicted was the astonishing pace of Williams' Nico Hülkenberg. The predicted rain had held off Saturday afternoon, but still caused a few concerns at the start of Q1, prompting drivers to make an early dash to set a representative time. The big question revolved around when and if the drivers would switch to dry tyres. Would it be a risky strategy, or was it just a matter of getting the timing right to pull a strong lap out of the bag? About halfway through the ten minute session, we saw some of the pit crews gathering themselves in readiness for tyre changes, with those green soft tyre stripes making their first appearance of the qualifying hour. Hamilton bolted them on, while Vettel had a bit of a wobble exiting the still very damp pit lane. We had been distracted by a worrying show of pace from Michael Schumacher, who had been sitting up in second position for much of the first five minutes of Q3. Was this his rain-master reputation finally shining through? No, was the answer. After the dry tyres came out, the Mercedes fell backwards, and it was to another surprise driver we turned our attention. 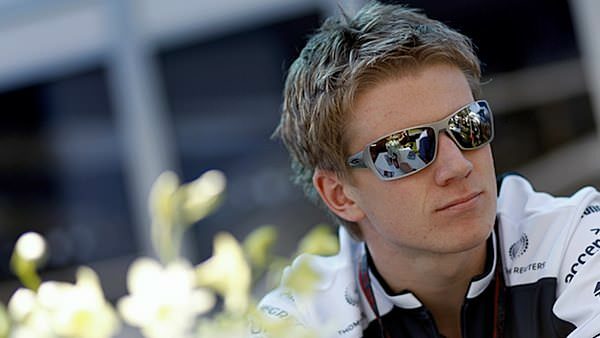 Nico Hülkenberg posted the fastest time of the day with just minutes remaining. Mr C and I looked at each other, saying: "Wouldn't that be awesome? It's never going to happen, but for Nico to show that team what he can do." Nico not only showed his team what he can do, but he put us firmly in our places too. He posted an even faster time on his second run, shaving an entire six seconds of his Q1 pace and crossed the line with enough time to give him a lap in hand. Vettel and Webber had to settle for 2nd and 3rd respectively, neither able to show anything like the pace of the Williams in Nico's hands. This result such a fantastic way to go into this Brazilian Grand Prix. It's also great news for Hülkenberg, a man who's likely to find himself the victim of Pastor Maldonado's burgeoning sponsorship budget. Team boss Frank Williams know the value of his driver, stating just last week that Nico is the real deal. He won all the way up to Formula 3 and GP2, he has won every single championship and in the right team, hopefully us one day, he will win the world championship as well in Formula 1. The problem Frank faces is that his team are still relying on Rubens Barichello's experience to drive the team forward. Williams' engineering director Patrick Head, confirmed after the session that it was Rubens who made the call to switch to slick tyres in qualifying, whereas Nico wasn't at all confident. Thankfully the man was overruled and managed to make the most of what he had under him. The start of the race tomorrow is going to be interesting. It's unlikely Hülkenberg can hold off two speedy Red Bulls for long, but what can he do to capitalise on such a strong Saturday? Nico has done the best job he can, no-one can ask more today. He's provided what must be the biggest qualifying upset of the year, just as everybody's eyes were firmly focused on the championship battle.